He went on to hail the commitment on bolstering the global economy that had been agreed at the recent Los Cabos meeting of the G20, and, despite lingering unease over the European sovereign debt crisis, Mexico believed the world economy was heading in the right direction. That meeting had also taken up a host of other socioeconomic concerns, including food security and providing safety nets for the poor. Mexico was integrating some of those relevant initiatives nationally, including through the launch of many programmes aimed at breaking the cycle of poverty. One such initiative targeted 6.5 million of the country’s poorest families and provided them with Government assistance providing certain conditions were met, such as ensuring children remained enrolled in school, for instance. Continuing, he said that with three years remaining to achieve the Millennium Development Goals, Mexico was making great strides, including providing universal health care, bolstering maternal and child health indicators, and ensuring free treatment and care for those living with the AIDS virus. Significant progress was also being made in the education sphere, and not just in the area of enrolment, but also in training teachers so that those persons could contribute more effectively to society. More globally, he said that in order to protect the gains achieved toward the Millennium objectives, Mexico proposed the identification of a second set of targets that were more aligned with specific national reality. Turning next to climate change, he said he was certain that each and every country represented in the Assembly was dealing with weather anomalies, either unprecedented flooding, lasting drought or tornadoes. 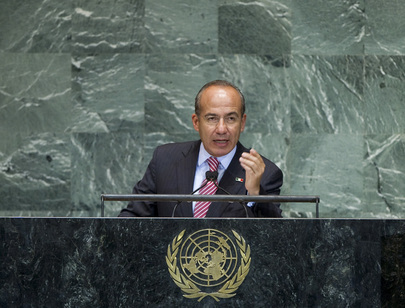 Mexico was committed to tackling climate change and other nations must be equally committed. Indeed, Member States must not fall victim to the “false dilemma” that they must either tackle poverty or mitigate the impacts of climate change. “I am here to say we can address both concerns at the same time,” he said, pointing out steps Mexico had taken to that end, including launching massive tree-planting campaigns and setting aside large tracts of land as protected areas. It had also held the sixteenth Conference of States parties to the United Nations Framework Convention on Climate Change in Cancún, which had led to progress towards the REDD initiative. “We are all responsible for the planet we share,” he said. As for transnational organized crime, which was upending countless lives in Latin America and posing a grave global threat, he said that illegal traffickers and other criminals used violence to achieve their aims. They also used their power to corrupt local governments and extort money from farmers and businessmen. “Organized crime is one of the main causes of death and violence today. It is also one of the main obstacles to democracy in the twenty-first century” he declared, emphasizing that Mexico had suffered severely and sadly, fallout from such criminal activity had turned the Latin American and Caribbean region into the most violent region in the world. Unfortunately, the situation had persisted largely due to inertia, but Mexico was fighting back. It was protecting its families. It was launching a historic transformation of its institutions to ensure that police officials protected the population. Yet, he said, all measures to tackle organized crime could not be taken at home, and to that end, he expressed supreme disappointment that negotiations on a comprehensive arms trade treaty had been unsuccessful. Such a treaty would prevent weapons from falling into the hands of traffickers and other criminals. Also, the time had come for drug consuming countries to evince the political will to tackle that issue. If they refused to take decisive action, then they must at least try harder to cut off the massive flow of resources that was giving criminal networks “an almost limitless power to corrupt.” While the region’s Governments were mobilizing to comprehensively address the issue, including through the establishment of a hemispheric mechanism that could monitor the situation, it was time for the United Nations to do more, including through assisting with the creation of a normative policy framework that combated crime, strengthened laws and law enforcement agencies, and restored social fabrics.